The Metropolitan Transit Authority of Harris County (METRO) is the region’s largest public transit provider, offering safe, reliable and affordable transportation services about 370,000 times per day. Besides operating more than 1,200 buses, METRO is currently expanding its 13-mile Red Line with two new lines under construction. METRO’s services also include: Star Vanpool, METROLift, HOV lanes, HOT lanes, Bikes-on-Buses/Trains program, Park & Ride, and road improvement projects. Learn more about METRO services at ridemetro.org where you will also find information about our T.R.I.P. app and the new digital, interactive rider tool METRO 360 [take a seat]. 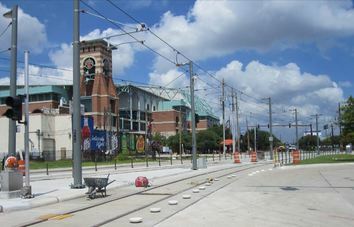 Light-rail construction activities continue near Minute Maid Park in the central business district. METRO contractors are working to meet a new, revised April 2015 opening date. The opening date for METRORail's new East End (Green) and Southeast (Purple) Lines has been revised. Issues affecting completion of the additional 10 miles of rail include problems on non-METRO construction projects in the central business district and the performance of equipment (axle counters) used to regulate METRO's light-rail traffic. The new light rail extensions are projected to transport paying customers by April 4, 2015. The August 21 break in the chilled water line, located directly under the Southeast Line, caused a significant delay in METRO construction activities. The water line repair activities alone lasted two weeks and METRO contractors had to work another three weeks to replace guideway that had to be moved to accommodate the water line repair. Additional work, including re-installation of fiber optic cable, signal testing and re-testing, brought delays to a total of 12 weeks. Problems with performance of Siemens axle counters which monitor light rail vehicle location, and control traffic signals and gate arms, were noted during early testing of the new North Line extension and a May, 2014 report cited temperature variations and moisture penetration as the root cause. This is a service reliability issue with the axle counters and METRO is actively exploring all available options to resolve the issue. Another issue affecting downtown light rail progress is construction of a garage over the Southeast Line adjacent to the GRB at Rusk Street and Avenida de las Americas. That construction requires nightly shutdowns of rail, impacting system integration testing and operations. METRO is coordinating with Houston First to limit delays.